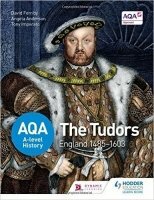 Enhance and expand your students' knowledge and understanding of their AQA breadth study through expert narrative, progressive skills development and bespoke essays from leading historians on key debates. - Builds students' understanding of the events and issues of the period with authoritative, well-researched narrative that covers the specification content - Introduces the key concepts of change, continuity, cause and consequence, encouraging students to make comparisons across time as they advance through the course - Improves students' skills in tackling interpretation questions and essay writing by providing clear guidance and practice activities - Boosts students' interpretative skills and interest in history through extended reading opportunities consisting of specially commissioned essays from practising historians on relevant debates - Cements understanding of the broad issues underpinning the period with overviews of the key questions, end-of-chapter summaries and diagrams that double up as handy revision aids The Tudors: England 1485-1603 A revised edition of Access to History: An introduction to Tudor England 1485-1603, this title explores the consolidation of the Tudor Dynasty under Henry VII and Henry VIII, the years of instability and religious turmoil in the mid-Tudor period and the period of relative stability during Elizabeth I's reign. It considers breadth issues of change, continuity, cause and consequence in this period through examining key questions on themes such as power, religion, opposition, relations with foreign powers and the impact of key individuals.